Tips to Share with your clients: Did you know you have until April 15th to contribute to your IRA (ROTH or Traditional) contribution for 2010? Fred Solomon, from Solomon Financial Mortgage shares IRA contribution information for 2010/2011. As mentioned earlier, the first contribution limit we’re going to talk about has to do with compensation. To be eligible for a Roth IRA contribution in a given calendar year, you need some form of compensation. But there is also an income limit for contributions. If your adjusted gross income exceeds these limits, then you are no longer eligible to contribute to a Roth IRA. Single filers, Head of Household or Married Filing Separately (and you did not live with your spouse during the year) with modified adjusted gross income up to $105,000 ($107,000 in 2011) can make a full contribution. Contributions are phased-out starting at $105,000 (or $107,000 in 2011) and you cannot make a contribution if your adjusted gross income is in excess of $120,000 ($122,000 in 2011). Joint filers with modified adjusted gross income up to $167,000 ($169,000 in 2011) can make a full contribution. Once again, this contribution is phased-out starting at $167,000 ($169,000 in 2011) and you cannot make a contribution if your adjusted gross income is in excess of $177,000 in 2010 or $179,000 in 2011. If your tax filing status is Married Filing Separately (and you live with your spouse), then you cannot make a Roth IRA contribution if your AGI is in excess of $10,000. Keep in mind that these catch-up contributions are in addition to the “normal” Roth IRA contribution limit. For example, in 2010 and 2011 you can make a contribution of $5,000. But if your age 50 and over by year’s end, you can make an additional catch up contribution of $1,000, making your total contribution $6,000. When is it okay to walk away from your home? Give this info to your homeowner who is going through this & watch what happens to your credibility. Feel free to refer your buyers to Solomon Financial Mortgage to do their loans. I give free seminars on this above info. Whether it is a primary, vacation, or investment property, you need to know how to protect yourself from the lender coming after you personally for any forgiveness of debt or the IRS coming after you for any potential tax consequences from a short sale or foreclosure, understanding insolvency & how you can avoid any federal or state taxes, understanding BK & Foreclosure laws, and how to use this info when negotiating with the bank (if you are going thru that process). When considering what you should do if you don’t qualify for a loan modification, you have to be aware of potential tax consequences of a short sale, legal ramifications (i.e. signing a promissory note where these lenders may have the right to come after you to collect), & know when it is a good time or not to walk away from a home that you own. Before you list your home for sale, you need to be aware of these 4 articles. If you or someone you know is going through this, please print out these articles & read them. If you have any questions after reading these 4 articles, talk to a CPA who understands Real Estate. We are not allowed to give out Tax or Legal advice, but I can certainly tell you what I would do if I was in your situation. In fact, my father is a CPA and my brother also happens to work with him. There are a lot of things that need to be considered. Please consult with your own CPA or Attorney. However, if you are insolvent, that will eliminate any tax consequences (please consult with your CPA). Please do not sign Promissory Notes in your Short Sale package. If you see one in the Short Sale package, don’t sign it, crumple it up & use it as practice for your basketball shooting skills. The lenders don’t catch it a majority of the time. By signing the promissory note, you are authorizing the bank to come after you for your assets (possibly record a lien on any new real estate you purchase down the road). It is not good. YOU HAVE BEEN WARNED! Learn the following words if you or someone you know is going thru this – FULL SATISFACTION & RELEASE OF LIEN & how to negotiate with the lender to ask for & receive a Full Satisfaction & Release. Pay attention to what is written above here & confirm this info with your CPA or tax advisor who understands Real Estate. Too many homeowners are just flat out not told or UNAWARE of any of this & there are situations where it may make more sense (tax wise, not necessarily credit wise) to let your property go into Foreclosure & be sold @ the Trustee Sale (especially if the foreclosing lender is purchase money & a non-recourse loan). You heard it here first & I have mentioned this on my radio program for the last 2-3 years. Give this info to your homeowner who is going thru this & watch what happens to your credibility. Feel free to refer your buyers to me to do their loans. I give free seminars on this above information. Facing Foreclosure? What you should know. I want to MAKE IT VERY CLEAR that I am NOT a CPA or Real Estate Tax Attorney. However, my father is a CPA (formerly on many of our radio shows and speaking engagements) and my brother works in that line of work as well. I ALWAYS say please consult with your own CPA and there are some of them who are giving out incorrect info (confirmed from my father from Solomon, Ross, Grey and Company – specializing in Real Estate). When is it ok to walk away from your home? Whether it is a primary, vacation, or investment property, you need to know how to protect yourself from the lender coming after you personally for any forgiveness of debt or the IRS coming after you for any potential tax consequences from a short sale or foreclosure, understanding insolvency & how you can avoid any federal or state taxes, understanding BK & Foreclosure laws, and how to use this info when negotiating with the bank (if you are going thru that process). When considering what you should do if you don’t qualify for a loan modification, you have to be aware of potential tax consequences of a short sale, legal ramifications (i.e. signing a promissory note where these lenders may have the right to come after you to collect), & know when it is a good time or not to walk away from a home that you own. Before you list your home for sale, you need to be aware of these 3 articles. If you or someone you know is going through this, please print out these articles and read them. If you have any questions after reading these 3 articles, talk to a CPA who understands Real Estate. We are not allowed to give out Tax or Legal advice, but I can certainly tell you what I would do if I was in your situation. In fact, my father is a CPA and my brother also happens to work with him. There are a lot of things that need to be considered. Please consult with your own CPA or Attorney. Here are those 3 articles. If you would like to talk to us about listing a property for sale & you owe more than what it is worth, do yourself a favor and check out these articles and then give us a call. Homeowners facing Foreclosure or Short Sale, Realtors who want to help protect homeowners from the lenders coming after them for the Forgiveness of Debt (down the road) & possible potential law suits for the Realtors for NOT notifying the homeowner that the lender may do that. 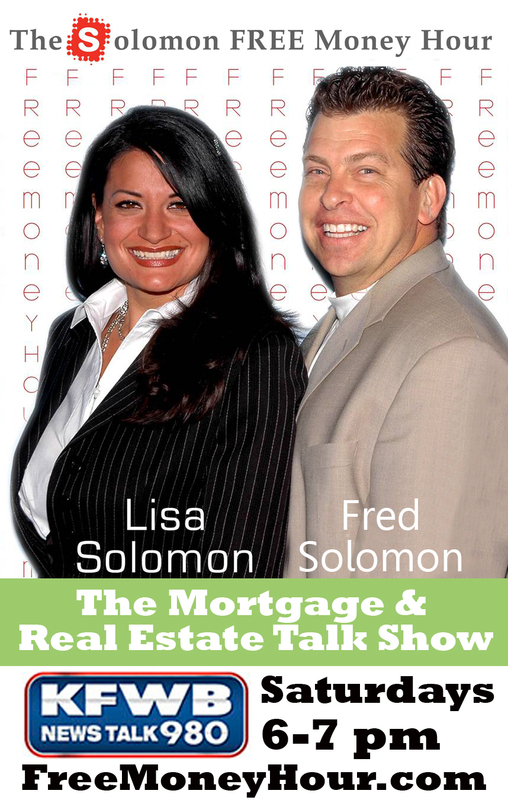 Industry leading The Solomon Free Money Hour Mortgage and Real Estate Show is live Saturdays: 6-7pm PST on KFWB News Talk AM 980 by hosts Lisa and Fred Solomon. Solomon Financial offers industry knowledge and is known for its no points, no fees, and no closing costs loan programs. They are ranked highly on Google for reviewing good faith estimates for free. This popular show offers assistance and solve your everyday problems over the air. The goal of The Solomon Free Money Hour is to educate consumers, homeowners, investors, CPA‘s, real estate buyers, sellers, mortgage and real estate professionals through its affiliate company: Solomon Financial Mortgage. A+ rated on the Better Business Bureau, it is easy to see why their radio show is popular among consumers. Topics included in their shows are what to do when borrowing and investing, the best loan programs in today’s marketplace, what loan officer’s don’t want you to know, mortgage relief help, how to buy or sell your home with the least amount of stress, how to protect yourself, when is a good time to purchase, first time buyers’ assistance and other popular topics. Guest speakers such as real estate attorneys, investors, Realtors, CPA’s, and consumers have the opportunity to give the audience an honest perspective. 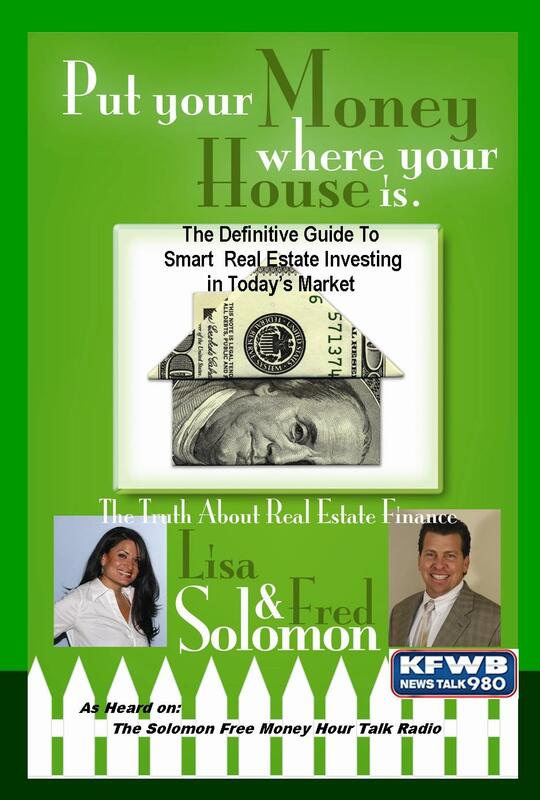 Fred Solomon, Jr. and Lisa Solomon are co-founders of Solomon Financial and authors of real estate books including Put Your Money Where Your House Is: The Definitive Guide to Smart Real Estate Investing. Collaboratively, they have aired over 270 live radio shows. Fred Solomon is now booking public appearances and keynote speaker engagements or welcomes new radio show guests. Solomon Financial and team are glad to help with a free consultation on your mortgage, refinance or purchase. True Zero Cost Loan Company helps consumers save millions! Solomon Financial Mortgage a zero cost loan company based out of Newport Beach, California, pledges to serve our clients with honest, up front, ethical information on matters pertaining to mortgage, real estate, investment and real estate finance. We pride ourselves in giving you the best consultation as if we were consulting our own family members. We are here to help you! We are A+ rated on the Better Business Bureau (the highest rating you can get) and celebrating 20+ years. Solomon Financial has zero complaints with the DRE (Department of Real Estate). The information, options and strategies our consultants and team members provide are based on your individual assessments, your long or short-term goals and your financial portfolio in today’s market.